When I first heard that The Disaster Artist was being made, I was a little concerned. Firstly, a film about one of my favourite worst movies could only be a parody, a less-than-flattering joke about a movie that has grown in cult status that the fans have taken to their hearts and I was feeling very protective about. Secondly, the people involved have not been my favourable when it came to comedies. I shouldn’t have worried. This is an affectionate yet uncensored look at the world of Tommy Wiseau, the genius behind The Room, a film that many have never even heard of but once experienced, will never forget. Greg Sestero wants to be an actor but seems he doesn’t have the confidence or the right attitude until Tommy Wiseau enters his life. A wild, careful man with a strange accent and dark black hair, who throws himself with aplomb into everything he does, takes Greg under his wing, takes him to LA, where the pair hunt for agents and look for work. Greg seems to have some success while Tommy has every door shut in his face, mainly because he is constantly told he would make a good villain. In Tommy’s eyes, he is a leading man. Taking his dreams into his own hands, Tommy decides to forget about trying to break Hollywood, instead, making his own movie with both Greg and himself in the starring roles. Thus The Room is born, a totally inept, ludicrous and terrible film which Tommy believes is as good as Tennessee Williams. 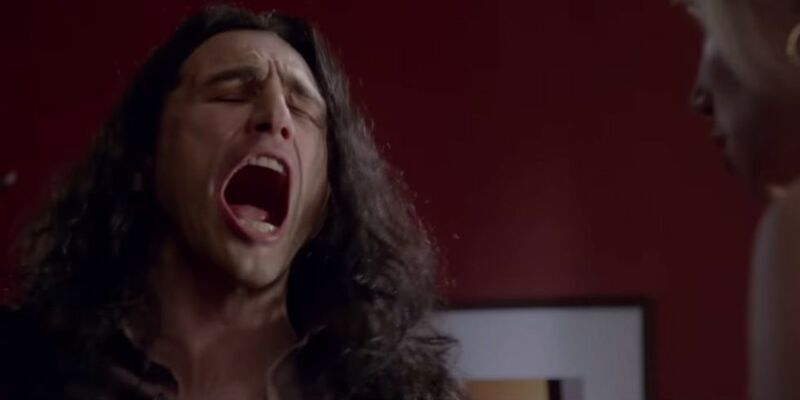 To really get this film into some focus, you have to understand that The Room, which cost $6 million dollars to make, would never have made a penny back had it not been picked up by cinemas who screen cult movies. It has become a phenomenon, where people go to shout, join in with lines and to throw plastic spoons (far too long a story to share here). It is no longer just another movie, but a cinematic experience, just like The Rocky Horror Picture Show became in the late 70’s and 80’s. Based on the book by Greg Sestero, Tommy friend and co-star, the film examines this very odd and weirdly dangerous man who refused to let Hollywood say no. Tommy is cloaked in mystery. He claims to be an All-American boy from New Orleans, although his accent is a strange mix of Eastern European and…alien. No one knows his age and, more importantly, no one knows where he gets his bottomless pit of money from. Yet once he has met and befriended Greg, we start to realise that Tommy wants more than friendship but he wants to rule the world with one best friend by his side and when it doesn’t go his way, he becomes monstrous and close to psychotic. This is why the film works so well. It doesn’t show Tommy through rose-tinted glasses but here’s a man who can be kind yet lacking in a real grasp on reality, while in the next breath, turn and act with complete selfishness and be barbaric., with Greg almost becoming a Jimney Cricket character, telling Tommy when he crosses the line. Where this becomes more apparent is during the filming of The Room. One moment you are laughing at Tommy having to be prompted countless times for a few lines, the next horrified at how he treats his cast and crew. All the while Greg being his angel. It is very obvious from the outset that director/star James Franco and his brother, Dave, love the subject matter. They understand and appreciate what The Room means to the fans and so never once do you feel they are mocking it or laughing at it and it’s charismatic maker, but they tell a story of a bro-mance and of how sometimes to reach for your dreams, you have to make them yourself. Tommy is utterly delusional and he believes he has made a film that will win Oscars (he hired a cinema to screen the film for two weeks in order for it to be eligible, and a roadside hauling for five years, advertising the film). Yet when we see the premiere (again, which he paid for) and how he feels when the audience starts laughing, you can sympathise with him, proving that he isn’t all monstrous but actually human. As Tommy and Greg, James and Dave excel. James, particularly, has picked up on Tommy’s quirks and personality brilliantly and made this odd man likeable without every covering up the fact that he wasn’t in real life. His friendship with Greg is surprisingly sweet and touching, while all the time you are never sure if this man will turn into a psychopath, making the viewing even more interesting. Yet all the while, Tommy seems unfazed by, well, anything., He went out to make a serious drama about a love triangle and it has become one of the biggest cult hits in years, which he claims he set out to make. 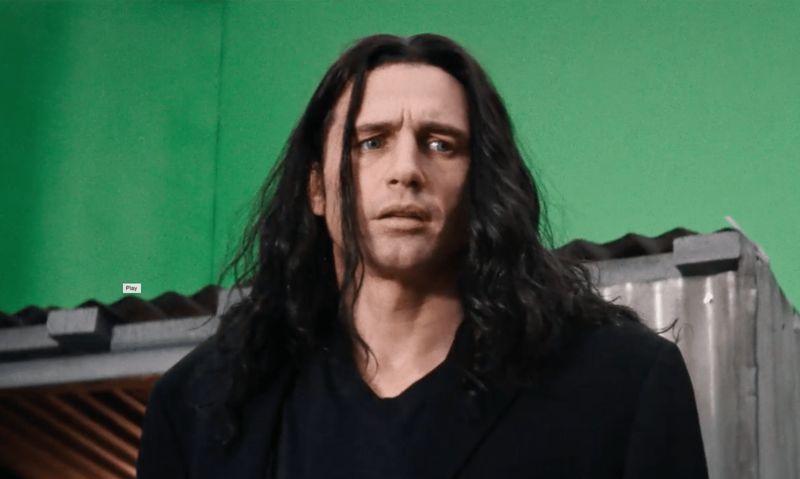 The Disaster Artist is hilariously funny, fascinating and sometimes off-the-wall dangerous but completely entertaining. It could easily be placed alongside Tim Burton’s brilliant Ed Wood as an example of two men who never gave up on their dreams, no matter who told them otherwise. I came out of the screening (after having a long conversation with both James and Dave Franco. No, seriously!) with a spring in my step and a smile on my face. My worries were gone and I cannot wait to see this again. Don’t worry if you haven’t seen The Room. My friend who I saw it with hasn’t and he laughed louder than I did. A pure delight from start to finish. I loved it. Please note: Do not leave before the credits are completely over. There are comparison shots between the real film and Franco’s as well as an extra treat right at the end, al la Marvel.